A Treasury Department spokesperson confirmed Secretary Steven Mnuchin requested a government plane for his European honeymoon earlier this summer. Treasury Secretary Steven Mnuchin requested a government plane for his European honeymoon earlier this summer. Mnuchin married actress Louise Linton back in June. ABC News cited anonymous sources when it first reported Mnuchin's request. A Treasury Department spokesperson later confirmed the news, saying Mnuchin did it because of his national security duties. Because Mnuchin is on the president's National Security Council, he needs to have a line of secure communication available, and a government plane would offer that. 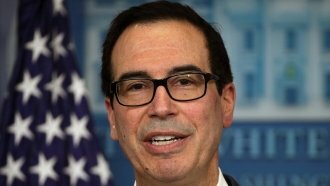 "It is imperative that [Mnuchin] have access to secure communications, and it is our practice to consider a wide range of options to ensure he has these capabilities during his travel, including the possible use of military aircraft," the spokesperson told ABC. The treasury spokesperson says Mnuchin's office pulled the request for a government plane after it found another option for that communication line. The Treasury's Office of Inspector General is already reviewing a separate trip Mnuchin and Linton made to Kentucky on a government plane in August. The inspector general's counsel told The Washington Post the office is looking at "all requests for and use of government aircraft," but wouldn't give more details about an inquiry into Mnuchin's honeymoon request.